When I was asked by Sun-Maid how raisins could be added to pizza, my first thought was a Margherita pizza. But then I explored lots of other delicious ideas. I found that the right balance of salty cheese or a sprinkling of coarse salt, or a little tang from lemon or tomatoes, are enchanting contrasts with sweet raisins. 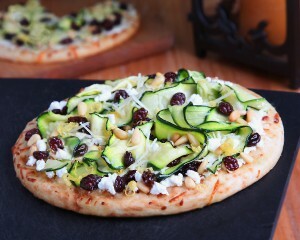 Shaved zucchini adds texture and fun along with lemon zest and salty goat cheese in my Zucchini Ribbons Pizza. Sliced tomatoes, fresh basil, garlic, mozzarella and Parmesan is a typical Margarita Pizza until you add a little zip with raisins and a sprinkling of coarse salt. Other ideas I liked were: Cheddar cheese, sliced apple and fresh cracked black pepper with raisins; caramelized onions with gorgonzola cheese, pinenuts and raisins; thinly sliced apples tossed with cinnamon sugar, Asiago cheese, walnuts and raisins on a crispy flour tortilla crust. During hot summer weather, my favorite way to “bake” the Zucchini Ribbons and Margherita Pizzas is on a Boboli type bread crust in a covered grill on medium heat, the way Rita makes her Grilled Portobella Mushrooms. While zucchini and tomatoes are at peak season it’s a perfect time to sample these pizzas — let me know what you think! Combine olive oil, garlic and lemon zest in a medium bowl. Slide a vegetable peeler firmly along the length of the zucchini to make thin “ribbons”. (see photo below) Mix zucchini ribbons with olive oil mixture. Sprinkle raisins over cheese. 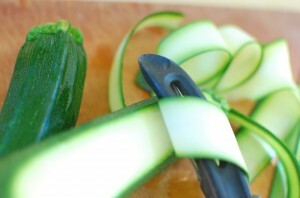 Arrange zucchini evenly on top, lightly folding and mounding zucchini ribbons. Sprinkle with Parmesan and pine nuts. Bake on oven rack or a baking sheet for 15-18 minutes (or in covered grill on medium heat) until cheese is melted and crust is lightly crisped. raisins on pizza? good try but I don’t think so! I love the raisin pizza concept. Raisins should not be limited to desserts, I love blending them in savory dishes like chicken salad, tuna salad and curry type stuff. I will forward your concepts to my friend Johnny who owns http://www.famousjohnnyspizza.com , I bet he would make a raisin pizza for his daily special! Thanks Rachel! If he puts them on a special I’ll come buy one! Please let me know if you hear about it. Thanks for bringing raisins to the dinner table. As Rachel mentions, raisins are a perfect complement to curried dishes! My favorite–curried onion and spinach pizza, sprinkled with sesame seeds and raisins or currants, adds texture and flavor contrast. Umm, curried onion and spinach with raisins would be delicious! Yes, raisins definitely have a place at the dinner table. Raisins are my favorite pizza topping, and everyone thinks I’m crazy, but they refuse to try it! So glad you’re putting it out there! Hey, you’re unique and we love that you like raisins on pizza! What other types of pizzas do you put raisins on? My grandmother who was came here from Sicily in 1918 made a square pizza with olive oil, spinach and raisins. It had no cheese. Thanks for noticing our pizza with raisins! Some of my inspiration was recipes I’ve seen for pizzas with grapes, olive oil and fresh rosemary. I’ve been trying to eat healthy lately, but I’m not sure how I feel about adding raisins to my pizza. I’ll try it and see what it’s like, but I’m not a very salty, sweet kind of gal, but I’m open to trying new things. If nothing else I can just take off the raisins altogether and have the zucchini pizza.